A true understanding of biology must include knowledge of its chemical origins, and comprehending the chemical events that gave biology its foundations – cellular format, the central dogma, the genetic code – is therefore a fundamental aspect of natural science. Furthermore, understanding the way in which extant biology arose can inform the design of 'synthetic' biologies. We are interested in uncovering prebiotically plausible syntheses of the informational, catalytic and compartment–forming molecules necessary for the emergence of life. We have previously demonstrated the constitutional self-assembly of pyrimidine ribonucleotides from mixtures of simple building blocks, and we are now exploring similar 'systems chemistry' approaches to the purine ribonucleotides, and ways of assembling RNA from these ribonucleotides with regiocontrol of the internucleotide phosphodiester linkage. We are also interested in the chemical origins of genetically encoded translation, and the abiogenesis of lipids. Chemoselective multicomponent one-pot assembly of purine precursors in water. J Am Chem Soc 24: 16677-16688. 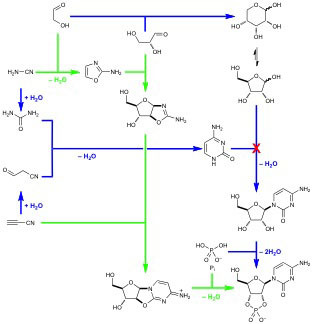 Synthesis of activated pyrimidine ribonucleotides in prebiotically plausible conditions.